Some of you may be wondering, why is this card not under the Background Noise series or the Name the Game series? Good question. The best answer I can come up with is that I really like cards that feature more than one player, which is why I came up with the Background Noise and Name the Game serials. Problem is, not every multiple player card has something going on in the background, and as I've found out, it is dang hard determining which game is portrayed on the card front. So, to solve this dilemma of potentially eliminating lots of cards that I love, I created a new series called Cameo Cards. Now, if you're a big movie or video game fan, you're probably familiar with the term "cameo" or in some parlance "Easter Eggs." What I hope to accomplish with this serial is to predominantly share "no-name" common player cards that feature All-Star or Hall of Fame players. 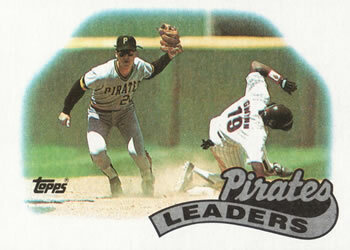 As shown in the example above, this 1989 Pirates Team Leaders card #699 depicts Al Pedrique tagging out Tony Gwynn at second base. Sweet. Hence, a cameo card of a Hall of Famer on a common. Great idea... looking forward to seeing future Cameo Cards posts. I keep this card in my Gwynn binder.